I’ve spotted a lot of Top Ten Holiday Reads lists lately. Fascinating reading, and they set my mind spinning in a direction that was similar but different. Ten books to transport you to Cornwall. Or to read on holiday in Cornwall. I’ve picked books that are in print – and I think they are all available electronically – and I’ve picked wonderfully readable books, old and new, that I can happily recommend. Daphne Du Maurier fell in love with a house named Menabilly on the north coast of Cornwall. In Rebecca she calls that house Manderlay, and she spins a wonderful tale of suspense intrigue and romance, with lovely echoes of Jane Eyre around it. Lucy Wood comes from Cornwall, she understands, really understands what makes it so special, and she mixes myth and real life to fine effect in this wonderful collection of short stories. Susanna Kearsley captures the magic of crossing the Tamar Bridge, leaving Devon and coming into Cornwall, and she captures the magic that draws so many people here in this lovely story of a house, a garden, history, time travel, and above all romance. Wilkie Collins crossed the Tamar by boat, a few years before the bridge was built, and he and his friend, the artist Henry Brandling, set out on a 214 mile walking tour. This account of their travels holds a wealth of material, wonderful vivid writing and extraordinary insight. So said Daphne Du Maurier, in her introduction to a story that is vividly and beautifully written. The man and the girl are utterly real, every detail rings true, and it is so easy to be pulled in, so easy to care. A visitor tells two children stories of the sea as they wait in their home, and Inn on a Cornish cliff, for the storm to abate and for their father to come home. Tales are deliciously twisted, and the final revelation – who the visitor is and why he has come – is perfect. This is the story of twelve year-old Gussie, who has a head full of films and books, who is fascinated by nature and the world around her home in St Ives. She is ill, waiting and hoping for a heart transplant, and that makes life all the more precious, and her story all the more life-affirming. I loved Gussie, and I loved seeing Cornwall through her eyes. On holiday at a Cornish hotel Poirot encounters an accident-prone heiress, and he soon realises that her accidents are not accidents at all. A solid mystery, a very nice setting; all in all, a lovely period piece from the 1930s. A wonderful family saga, spanning half a century, telling their story and the story of Penmarric, their grand Cornish home, in five voices. The house, its inhabitants, the world around them come to life in a dramatic, compelling story. I had no idea when I first read it that it was inspired by real mediaeval history …. The story of a girl from a Cornish village who loses her home when her grandparents die, moves to town, and finds herself caught up in a story elements of chick lit, strands of a psychological thriller, and echoes of Daphne Du Maurier’s Rebecca. It’s wonderful fun! There are more books of course, by these authors and by others. 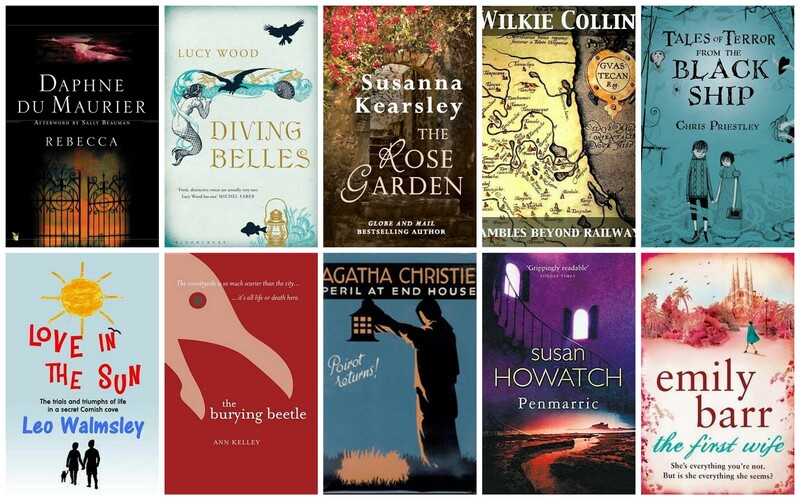 Have any of these books, or have any other books, transported you to Cornwall, I wonder … ? New reader 🙂 huge du Maurier fan – think you need a bit of Jamaica Inn on your list 😉 – many of the others are now on my (never-ending) wish-list though! Hello Beth, it’s lovely to meet you. I wouldn’t argue with Jamaice Inn, but I couldn’t resist Rebecca and I wanted ten different authors. I’ve loved Daphne Du Maurier ever since I picked up her books when I first joined the adult library. Susan Cooper’s Over Sea Under Stone is the magical mystical Cornwall. And Helen Dunmore’s Zennor in Darkness is based on D H Lawrence’s time in Cornwall during the 1st World War. Thank you for two excellent recommendations. I have yet to read Susan Cooper – and I must, because I know so many people love her books. I have read Zennor in Darkness, and thought about putting it on the list but I wasn’t sure that it would work as a holiday read as well as some of the others. A lovely list. I’ve read 6 of the 10 & I agree, they all transport the reader to Cornwall. I’d have to add Mistress of Mellyn by Victoria Holt, a book I read over & over again when I was young. Also the Poldark novels by Winston Graham, especially the first six. I read Mistress of Mellyn for the first time a year or so ago and loved it. It got squeezed out of the list because there were too many books to chose from. and because I didn’t want too many gothic romance in big house on cliff type books. And I loved that Mistress of Mellyn and The Rose Garden started on the same train. I read the Poldark novels when I was at school, but I haven’t picked them up since. A re-read might be interesting. Oh, Thank you so much for this list! I swear I will visit Cornwall before I die! I have read a few of these books and will be adding the others to my list of MUST READ! You are very welcome Staci. I do hope that you make it to Cornwall one day, and that we can meet then. What an appealing list! There’s only a budget for armchair traveling this year, so Cornwall may be my destination! I thaink it’s going to be armchair travelling holidays for me this year too. Aren’t we lucky to be able to travel by book?! I’ve read five from your list and have made a note of the balance five! Excellent! It’s a varied selection but they are all books I am confident in recommending. Thanks for the list! I’m only familiar with the Du Maurier and Wilkie Collins. Am much intrigued by the Agatha Christie now and will definitely look to this list whenever I start missing Cornwall. Oh Fleur, how could you have missed off The Great Western Beach by Emma Smith? It’s one of the most enchanting childhood memoirs I’ve ever read. You know how much I love Cornwall so I will write down the books here that I haven’t read and, with luck, savour them this summer. Thank you, Jane! I love making these lists. I tried to be diverse. so I can’t promise you’ll love them all but the do all capture the place for me. I’ve just discovered your blog! I love Cornwall and there are many on your list with which I am unfamiliar -what treats to come! How about the novels of Patrick Gale? I particularly loved “Rough Music” and his latest “A Perfectly Good Man”. Hello Deborah, it’s lovely to meet you. I have liked Patrick Gale’s books, but they don’t evoke the magic Cornwall for me in the same way as the books I’ve listed. That might be because I’m more drawn to books set in the past, or it might be that he’s too close to home (he lives just a few miles away) but sees this area in a different way to me. Fabulous list! I am just listening to Jamaica Inn after having read it for the 2nd time earlier this year. The Bodmin landscapes are beautifully described and in such detail. Just wonderful! Rebecca brilliant too for a Cornish feel. How about The Camomile Lawn? – I guess a lot of it plays in London, so not entirely Cornish. That settles it, I must re-read Jamaica Inn! I did think of The Camomile Lawn, but I thought of a couple of other Cornwall/London/War books and I couldn’t pick one and so none of them went on the list. Juliet Greenwood’s Eden’s Garden is set in Wales and Cornwall and that really took me back to both places, set in contemporary and historical times.